How Does GM's OnStar Service Work? OnStar is a subsidiary corporation of General Motors that provides a variety of in-vehicle services, which are all delivered using a CDMA cellular connection, but it's also the name of a service that's available in new GM-family vehicles. Some of the services available through the OnStar system include turn-by-turn navigation instructions, automatic crash response, and roadside assistance. All of these features are accessed by pressing a blue “OnStar” button, a red “emergency services” button, or a hands-free calling button. General Motors established OnStar in 1995 with cooperation from Hughes Electronics and Electronic Data Systems, and the first OnStar units were made available in several Cadillac models for the 1997 model year. OnStar is primarily available in GM vehicles, but a licensing agreement also made OnStar available in several other makes between 2002 and 2005. A stand-alone unit was also released in 2012, which provides access to some of the OnStar services. Each OnStar system that’s installed as original equipment is capable of gathering data from both the onboard diagnostics (OBD-II) system and built-in GPS functionality. They also use CDMA cellular technology for voice communications and data transmissions. Since OnStar subscribers pay a monthly fee for the service, there are no additional charges from the carrier that handles the voice and data connection. However, additional charges are incurred for hands-free calling. In order to provide turn-by-turn directions, GPS data can be transmitted using the CDMA connection to the central OnStar system. The same GPS data can also be used for emergency services functionality, which allows OnStar to summon help in case of an accident. OnStar is also capable of transmitting data from the OBD-II system. This feature can allow OnStar to track your mileage for insurance purposes, provide you with vehicle health reports, or even determine if you’ve been in an accident. Since you may find yourself unable to reach your cell phone after a serious accident, the OnStar call center is notified when the OBD-II system determines that your airbags have gone off. You may then request assistance if it’s needed. OnStar requires a subscription in order for it to work, and there are four different plans available. As you'd expect, the Basic plan, which is the least expensive, omits many of the features available in the more expensive plans. Some features are available as an add-on and so do not come with the plan. The hands-free calling function is an exception in the Guidance plan where it's included by default but only works for 30 minutes /month. See OnStar's Plans and Pricing page for detailed information on these plans, including all the features and pricing options. OnStar is included with all new GM vehicles, and some non-GM vehicles also include it. You may find these systems in certain Japanese and European vehicles that were manufactured between the 2002 and 2005 model years. Acura, Isuzu, and Subaru were the Japanese automakers that were party to the deal, and both Audio and Volkswagen signed on as well. If you purchase a GM vehicle that was produced during or after the 2007 model year, it may also include a subscription to OnStar. After that model year, all new GM vehicles come with a subscription. You can also access OnStar in non-GM vehicles by installing the OnStar FMV device. 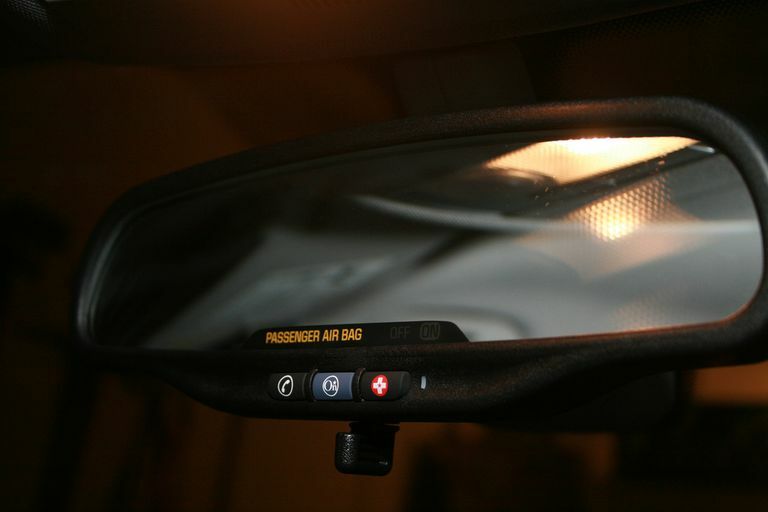 This product replaces your rear-view mirror, and it gives you access to many of the features that are available from OEM GM OnStar systems. You can see if your vehicle is compatible with this OnStar add-on in this PDF. How Do I Use OnStar? All of the OnStar features are available from one of two buttons. The blue button that sports the OnStar logo provides access to things like navigation and diagnostic checks, and the red button is used for emergency services. If you have prepaid minutes, you can also press the hands-free phone button to make phone calls, access weather reports, and receive other information. The blue OnStar button allows you to speak to a live operator at any time of day. The operator can set up turn-by-turn directions for you to any address, look up the address of a point of interest, or make changes to your account. You can also request a live diagnostic checkup, in which case the operator will pull information from your OBD-II system. If your check engine light comes on, this is a good way to determine whether the vehicle is still safe to drive. The red emergency services button also connects you with an operator, but you will be put in touch with someone who is trained to deal with emergencies. If you need to contact the police, fire department, or request medical assistance, the emergency advisor will be able to help you. Can OnStar Help If My Vehicle Is Stolen? OnStar has a number of features that can be of assistance in case of theft. The system can act as a tracker, which can allow the stolen vehicle to be found and recovered. However, OnStar will only provide access to this functionality after the police verify that a vehicle has been reported stolen. Some OnStar systems can also perform other functions that might make it easier to recover a stolen vehicle. If the police have verified that a vehicle was stolen, an OnStar representative may be able to issue a command to the OBD-II system that will slow the vehicle down. This functionality has been used during high-speed car chases to stop thieves in their tracks. Some vehicles are also equipped with the ability to remotely disable the ignition system. That means if the thief shuts your vehicle off, he won’t be able to start it back up again. What Else Can OnStar Do for Me? Since OnStar has access to many of your vehicle's systems, there are a number of ways that an OnStar operator can help out if you're in a bind. In many cases, OnStar can unlock your vehicle if you accidentally lock your keys inside. The system may also be able to flash your lights or honk your horn if you're unable to find your vehicle in a crowded parking lot. Some of these features can be accessed by contacting OnStar, but there's also an app that you can install on your smartphone. The RemoteLink software only works with certain vehicles, and it's not available for all smartphones, but it can give you access to live diagnostic information, allow you to start your vehicle remotely, and also contact an OnStar advisor when you're not in your vehicle. Are There Any Privacy Concerns With Services Like OnStar? OnStar has access to a lot of data about your driving habits, so some people have expressed concerns about privacy. The FBI has even attempted to use the system to eavesdrop on private conversations, but the Ninth Circuit Court of Appeals denied them the ability to do so. OnStar is also set up so that it makes an obvious noise whenever an operator places an incoming call, which makes it impossible for an unscrupulous operator to eavesdrop. OnStar also claims that it anonymizes GPS data before selling it to third parties, but this practice remains a privacy concern. While the data may not be tied directly to your name or the VIN of your car or truck, GPS data is by its very nature not anonymous.